After I graduated from Indiana University, I worked for a lab technician for two years. During that time I researched graduate schools extensively. Cornell’s GGD program fulfilled everything I was looking for in a graduate program. It has researchers from every discipline imaginable, amazing core facilities, and active graduate student life. I was particularly impressed by how invested faculty members were in their own and other GGD students. Cornell professors love to collaborate with each other, which turns out some amazing interdisciplinary work. I specifically applied to Cornell to work with both Dr. Brian Lazzaro and Dr. Mariana Wolfner on a longstanding collaborative project to find the mechanisms controlling a trade-off between female reproduction and immunity. Additionally, one my undergraduate mentors, Dr. Kristi Montooth, is a GGD PhD alumni from Andy Clark’s lab. I knew that the GGD program had trained some amazing scientists and I wanted to follow the same path! A big factor in my decision was the support offered to students by the department and graduate field at large. It mattered a lot to me that GGD students feel comfortable approaching faculty members for advice, but also work to support one another. There are also a lot of opportunities to take a break from the lab and socialize with GGD and other graduate students at the Big Red Barn. I have really enjoyed exploring Ithaca’s many waterfalls, festivals, and restaurants with my fellow GGD students! I am now working with Dr. Brian Lazzaro and Dr. Mariana Wolfner on the mechanisms controlling the trade-off between reproduction and immunity in Drosophila melanogaster. Mated females have a lower capacity to induce antimicrobial gene expression, and have a higher bacterial load and higher risk of death than virgin females after infection. I am building upon the work of two former GGD students to characterize the hormonal signaling mechanisms that increase egg production after mating and also increase risk of infection. Specifically, I am interested in how investment of resources to egg production, particularly yolk proteins, limits immune response. The flexibility of GGD program and my advisors has allowed me to combine my interests in immunity and reproduction. After one full year at Cornell, I couldn’t be happier with my choice of graduate school. First of all, I am amazed and impressed by the depth and the breadth of research being performed. The areas of expertise in so many diverse fields in one institution is rare to come across. It is amazing to me that I could have a question or an experiment dreamed up in my head, and I can reach out to local resources for help, no matter what challenge is being presented. I also think that the faculty here are great teachers, mentors, and scientists. My fellow graduate students are friendly, helpful, and intelligent. I know that I’ve made many lifelong friends–and that the people around me are going to be fantastic scientists. Most importantly I think that the GGD program at every level want to see the students thrive, and support us through all stages of our journey. In the Simoes-Costa lab, we are focused on understanding the development of neural crest. In particular, I am working on understanding the gene regulatory network that controls neural crest development. I aim to use time-resolved transcriptomics to identify new members of this network and develop computational methods to infer direct transcriptional regulation utilizing this data and other genome-wide assays. In the future, I hope to expand this type of analysis to neural development. When I first arrived in Ithaca for my interview weekend, I was surprised by how welcoming, relaxed, and sincere the students and faculty were. I have been performing research since high school, so when it came time to choose a graduate program, I knew that I wanted an interdisciplinary environment where the science was cutting-edge. I also knew that I did not want a program that promoted any stressful competition between students, which can be seen sometimes in top-notch universities. Cornell really wowed me by fitting all of my criteria. The GGD program has exceeded all of my expectations for graduate school, and I feel as though I have already learned so much about the field (and myself) in the short amount of time since I’ve arrived. I’ve come to realize that everybody here wants to see you succeed. I have yet to see a PI in Cornell who is not excited to share their advice and knowledge with anyone interested. There are so many opportunities for career development here as well, starting in your first year. Cornell recognizes that the job market for a PhD student is so diverse nowadays, and the university really tries to cater to each students’ interests to ensure that each of us can succeed in whatever we want to do once we graduate. While it was scary moving to upstate NY from the south, I was comforted by the city. It’s not too big, but it is very lively and beautiful. I find it to be the perfect environment for graduate studies: not only is there high-quality research happening here, but Ithaca and Cornell have so many events, festivals, and organizations that go on throughout the year, it gives me the perfect balance between work and life to keep me sane during my graduate studies. I was born and raised in the small city of Sault Ste. Marie in Northern Ontario, Canada. I completed my undergraduate degree in Biology at McGill University in Montreal, Canada, where I also completed my Masters degree. What led me to apply to Cornell GGD was meeting a Cornell professor (now my PhD advisor) at a conference I went to the summer before applying for PhD programs. I was intrigued by his research and how highly he spoke about Cornell – and that stuck in my mind for months. After interviewing here I realized how amazing this institution is, and also how friendly and happy the students are. 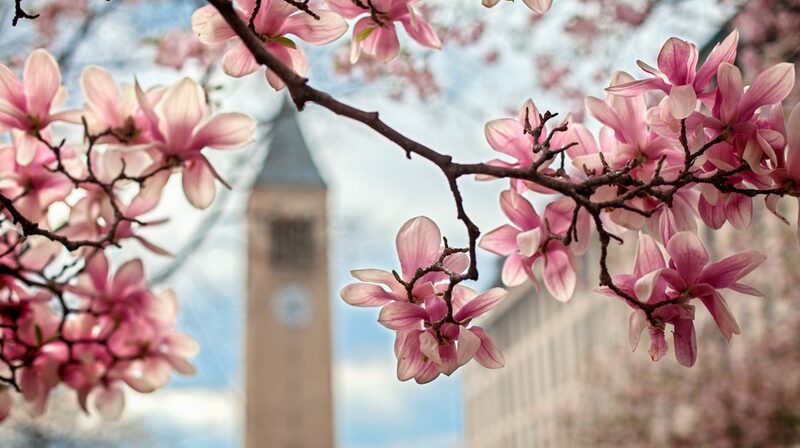 In the end, I chose Cornell GGD because I felt it had the potential to satisfy both sides of me: excellent opportunities and resources for research, and an excellent town for me to enjoy my extracurricular activities. I am also a competitive long-distance runner and a recreational equestrian rider, and Ithaca has provided an amazing community for these activities. I joined the Clark lab, and we are interested in all things evolutionary genomics. My project investigates repetitive DNA (actually the majority of most eukaryotic genomes), and how and why it evolves. I use computational and wet-lab approaches to study satellite DNA and transposable element regulation in Drosophila. I am currently trying to understand how and why one species, D. virilis, has half of its genome composed of 7 base pair tandem repeat. In the future, I plan to use a phylogenetic approach to understand host regulation of transposable elements, and the reasons for repetitive DNA diversity across species. I joined the GGD program at Cornell because its excellent track record of training research scientists, and also because of graduate students’ enthusiasm for fundamental researches here. I had worked as a visiting undergraduate student at Cornell for a year and Cornell became my top choice for graduate studies as I knew more about this institute. During my visiting, I got the chance to appreciate a variety of research topics via seminar series and symposiums held on campus. Students were so excited to present their work and share feedback among each other. To get rigorous training is among the most import goals I wanted to achieve in graduate school, and GGD is an excellent fit for me. Besides, the warm and friendly atmosphere in Ithaca made me feel very comfortable living here. After I joined GGD, how wonderful our cohorts could be still surprised me. Students care about each other and I know my friends in the program will be supportive whenever I need them. I also appreciate that faculty care about growth and career development for students. Working and studying here is really enjoyable. I am a member of the Han Lab, and we are interested in the mechanisms of dendrite development and dendrite degeneration, by using the Drosophila sensory neurons as a model system. By using cutting edge technologies in molecular biology, cell biology, microscopy, and genetics, we wish to uncover core principles of dendrite morphogenesis at molecular and cellular levels both during normal development and in neuronal degeneration. I am exploring how degenerating neurites are recognized and cleared by using long-term time-lapse live imaging and tissue-specific CRISPR tools. Ultimately, I am driven to decipher the secret of how neuron-environment interactions shape every step of dendrite morphogenesis. The fidelity of DNA replication through subsequent cell divisions is critical for maintaining the integrity of the genome and preventing cancer. Replication timing, the spatiotemporal pattern of replication origin firing, is highly reproducible across samples and tissues and shows hallmarks of broad functional conservation through evolution. We believe that these replication timing profiles are causally linked to the accuracy of replication. In particular, I am interested in quantifying the degree of heterogeneity in replication origin firing within a single tissue of an individual: how much do these clonal cells vary in which origins are used and when during S phase they begin replicating? What can this tell us about how tightly replication timing is regulated and what mechanisms might be involved? I’m seeking to identify Arid1a as a driver of mammary carcinoma within our CHAOS3 mouse model. Chaos3 mice have a missense mutation in MCM4 which causes destabilization of the MCM2-7 helicase. When this mutation is congenic in C3H-FeJ background ~80% of female mice succumb to spontaneous mammary tumors around 12 months. Upon tumors being collected Arid1a was found commonly deleted in 70% collected. Always Arid1a was deleted on one allele suggesting it may be haploinsufficient. I will seek to address if early inactivation of Arid1a facilitates mouse mammary tumors sooner. I was attracted to the highly collaborative research environment. Faculty frequently collaborate both within and outside Cornell, leading to an enormous diversity in research. My main project is focused on locating replication origins in humans. While we know a great deal about where and how replication origins are established in yeast, we still know very little about how the location of origins are determined in humans and other higher eukaryotes. Over the years, assays have been developed to determine origin location; however, the results are often extremely noisy and rarely agree with other assay results. The Koren lab studies the spatiotemporal in which DNA is replicated (replication timing) and has high resolution replication timing profiles for hundreds of individuals. Origin locations can be inferred from peaks of very early replicating regions. Using these profiles and publicly available data from genomic assays targeting replication origins, I aim to identify locations of commonly used replication origins and genomic features that are likely to distinguish locations for origin usage. Originally from Ithaca’s neighboring town, Lansing, NY, I attended Johns Hopkins University where I majored in Molecular and Cellular Biology before returning to Ithaca for graduate school. I was initially drawn to Cornell’s GGD program by interest in the research of several faculty members. Upon visiting, I chose Cornell after experiencing the supportive and collaborative environment of the graduate students. I joined the Pleiss lab, where we are broadly interested in the regulation of mRNA splicing. Specifically, I am interested in understanding the underlying cis regulatory signals which allow the spliceosome to recognize and assemble upon introns prior to their removal, especially in the context of alternative splicing. Outside of lab I like to take advantage of Ithaca’s scenic environment by running, hiking, and skiing as well as its social climate by playing soccer and volleyball in the local leagues. My research experience before grad school was mostly in ‘wet lab’ work but I was very interested in developing computational ‘dry lab’ skills and pursuing projects that would allow me to do both. Furthermore, I wanted to develop and apply teaching skills for science education. I’m currently working on a few different projects in the Clark Lab. My main one focuses on generating and studying a full transcriptional profile of gene expression dynamics of the Drosophila innate immune response at high temporal resolution. Discovering and reconstructing gene regulatory networks from high-throughput time-course gene expression data constitutes a key problem in functional genomics and bioinformatics, and I’m very interested in developing and applying new approaches for analyzing this kind of data in the Drosophila immune response model. Finally, as a Distinguished Active Learning Teaching Assistant (DALTA) Fellow, I’m also working on bringing active learning techniques to the classroom to facilitate a more inclusive and engaging science education. One of the most influential aspects of the Department of Molecular Biology and Genetics (MBG) for my academic success and personality development as a scientist has been the ease for collaborations; MBG faculty are open for new ideas and are welcoming for collaborations. In the Grimson lab, we are interested in understanding various mechanisms by which microRNAs (miRNAs) and 3’ untranslated regions (3’ UTRs) control post-transcriptional gene regulation. My research interest lies in understanding how gene regulatory networks controlled by miRNAs shape the biology of immune cells. To do that, I develop experimental and computational approaches to disentangle and study miRNA-mediated regulatory networks in mammals. My various collaborative projects involve study of gene expression in immune cells and germ cells using different high-throughput genomic approaches such as RNAseq, smallRNAseq, PROseq, ATACseq and single-cell RNAseq.